An unusual interface allows the user to carve through thoughts, mapping the movements of the reader's arm, via the mouse, onto a course of short phrases. Even the smoothest motion of the mouse results in staccato sounds and instantly-appearing text. This short piece invites many slow tracings by which different texts can be encountered as the image becomes sculpturally more distinct. Author description: Carving in Possibilities is a short Flash piece. 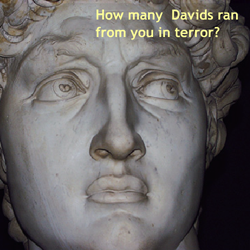 By moving the mouse, the user carves the face of Michelangelo's David out of speculations about David, the crowd watching David and Goliath, the sculptor, and the crowds viewing the sculpture. Instructions: To hear the sound, turn on the computer's speakers or plug in headphones. Move the mouse over the image. Previous publication: Carving in Possibilities was published in frAme: Online Journal of Culture and Technology issue 6, http://trace.ntu.ac.uk/frame6/, in 2001.